Toyota’s previously unseen 2010 Formula 1 car,the TF110 has run for the first time. Kazuki Nakajima gave TF110-01 a brief shakedown outside the teams base in Cologne, Germany. 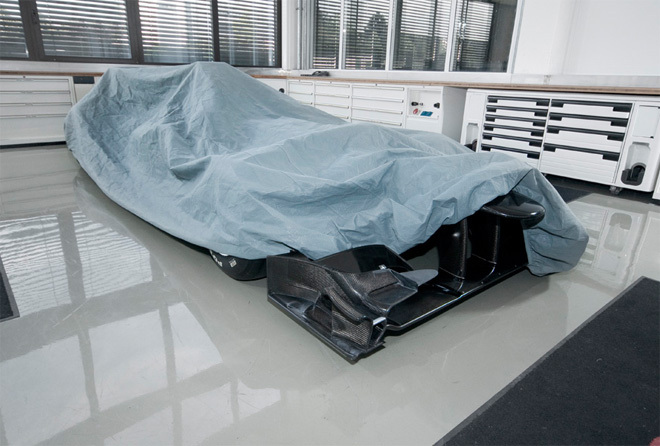 Two chassis were constructed despite the teams late departure from Grand Prix racing last year. The design features one of the most extreme diffusers seen yet as well as a ride height adjustment system. 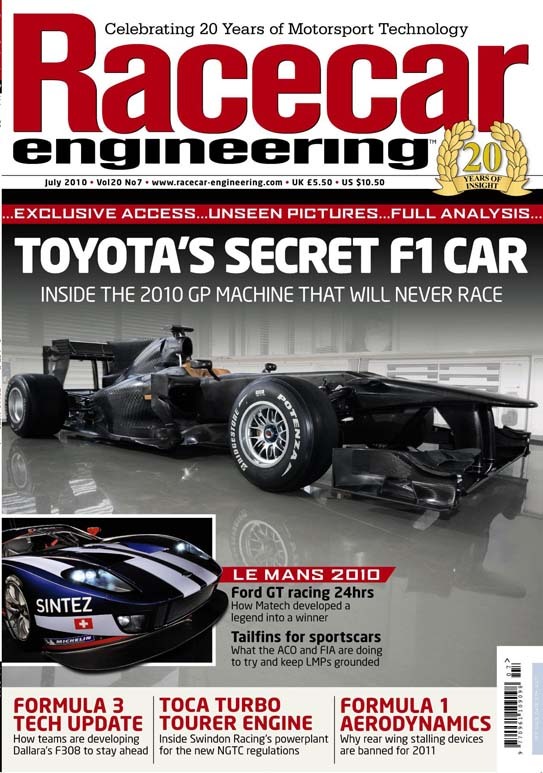 Racecar Engineering has been given unprecedented access to the two cars and has a full technical review of the TF110, including detailed under body images of the design appears in the July issue of the magazine, available now in digital form. This entry was posted in Publications, Toyota TF110 by scarbsf1. Bookmark the permalink. There’s a big missed opportunity here. These chassis ought to be used by an FIA team as testbeds for improving racing in F1. Only by having a well funded independent team of engineers testing the consequences of possible rule changes, might closer racing and real success in reducing aero, be achieved. F1 must be the only business where radical change is never tested before being implemented. And is that not – at least in part – the point? If rule changes were only ever imposed to limit performance, then certainly. Designers use the opportunity to innovate and quickly reclaim lost performance. But if there is any real consensus about the need to shape the rules in a way that allows better racing, then to rely purely on technical working groups involving vested interests (the same designers) is akin to turkeys being allowed to vote for Christmas. Radical change can only be achieved by technicians working apart from the teams. Give them the proper tools, including, I would argue, proper testbeds to provide real evidence of improvements to overtaking etc. Designers will continue to innovate and reclaim performance, but at least those shaping the rules would have a chance to keep abreast of such innovation. Currently, any large rule change that is purported to be aimed at improving the show is hit and hope at the best. How long has reduction of aero to allow closer racing been talked about? Too long. Would have like to see this car race. Seems they were just getting it all together team wise. Shame they underperformed, I really thought they were going to take a win in 2009. I wonder if the ride height system would be legal. This is why I subscribed racecar engineering last month! Why did USf1 or HRT not buy the toyota chasis when it was actually done up and very much available? Money would have been a problem for both of them – it already was. Also, HRT had/has a deal with Dallara and USF1 wanted to be able to put a ‘made in the USA’ sticker on it.